Do you enjoy riding on the new Buchanan Street Bikeway, under the underpass and to the Waterfront…where you lock your bike to the new bike racks? Do you ride or walk on the upgraded Ohlone Greenway? Do you use any of Albany’s “Bike Bike Racks” when you frequent our businesses? These are all projects that Albany Strollers & Rollers has coordinated, funded and/or contributed to. Please consider giving back to our organization by volunteering your time this month! May is Bike Month, which means it’s the busiest time of year for our group and our city! 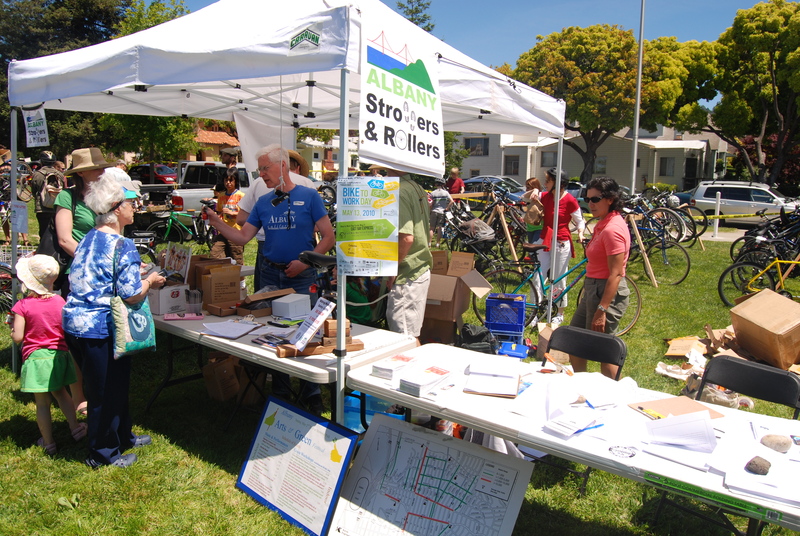 AS&R’s booth at any Albany event is a hub of activity – have questions? come on by! 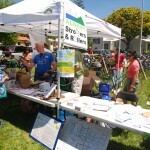 Volunteers needed for outreach at our booth, coordinating the Bicycle Valet Parking and bike tuneups. *All volunteers who help for 2+ hours get a delicious CHIPOTLE BURRITO, thanks to the El Cerrito Chipotle, for lunch! *Plus, the first 15 people who sign up to volunteer get a special discount coupon from our Bike Valet Parking sponsor Bua Luang Thai Cuisine! RSVP ASAP to Amy Smolens to make sure you get lunch and a coupon! Consider joining us for a few hours or more! Volunteer help is needed to promote Albany Strollers & Rollers, discuss upcoming projects related to walking and biking (bike lanes, sidewalk conditions, bike rack locations, etc. ), get feedback from the community about what their needs/interests are, and to give away, and sell, bike lights and talk about our Bike Light Program. I have volunteered at all of these events in previous year and have always enjoyed meeting new people. And if that wasn’t enough to get you to commit, there’s free food and giveaways available for all volunteers! Volunteers needed to count cyclists, hand out swag bags and goodies, outreach at tables and just to provide a smile and a wave to passersby. Food, coffee and swag available for all volunteers! We also need folks beforehand to contact businesses for donations (Marie has done legwork and has contact information) and help stuff swag bags. To help in preparation, contact Nick Pilch. Volunteers needed to blend up frosty smoothies with the Bike Blender, help fit kids’ helmets (Ken McCroskey will give you on-site training,) answer cycling questions from parents and kids. Please respond to Amy Smolens to let us know which event and time you are available to help with. Thanks a lot – look forward to hearing from you and seeing you at the events!